A bunch of pretty horse ladies (and/or gentlemen...?)!! It's so beautiful!Keep doing a great work! I didn't think a pegasus could look so pretty. haha aww <3 thank you! This is lovely. The soft colours are very pleasing, and I love how slender and elegant you drew their bodies. 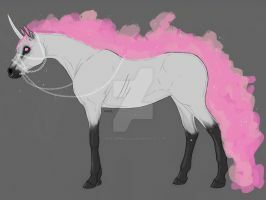 You draw the best horses/unicorns/pegasi! Thank you <33333333333 ; ; I blame the 80s!!!! i would totally love a shirt of this! You might want to try Studio 6? I don't know much about them, though. I found a place! Thank you though! I was just looking up convention resources yesterday. One page list these three sites. I've never heard of em personally so I can't vouch. If one happens to work out let me know, I'll be on this hunt soon enough. Why not try out Designbyhumans.com or threadless.com if only for the huge amount of traffic they get. Keep making those lovely things you do! Agh~ I love this design! ; 3; It's so cute and pastel colours are always nice. ^^ I especially love the purple one! Destroy Lisa Frank and take over her company. Hey, it's a good plan, don't fault it! I second this. Especially considering her stuff has gone down hill since the lack of funky coloured animals. Modern-day Lisa Frank is specifically formulated to create seizures. So that's why I get a headache when I look at it.